DENVER — Bryce Harper stood Friday night on second base with his helmet off and waved to the Philadelphia Phillies' dugout. Just one strike. That's what separated the Philadelphia Phillies on Tuesday night from their eighth win of the season and a victory that would have tied the franchise mark for the best start in 104 years. The Nationals, again. Hooray. 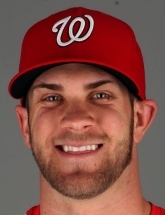 Hey, it’s the Nationals, that team Bryce Harper used to play for that doesn’t really have a legacy outside of early playoff losing. Well, they’re back for the second of many times they’ll face the Phillies (and Bryce Harper) this year. Last time, they had to rely on the Phillies’ wilted bullpen to win them one game out of a two-game set in D.C. This time, they’ll have to find a way to win in a stadium full of Phillies fans! So, exactly like last time, really.